Situated in the mountains, this property is 0.1 mi (0.1 km) from Grenzlandschaft and Museum Sorge and 1.4 mi (2.2 km) from Ring der Erinnerung. St. Salvator Church and South Harz Nature Park are also within 6 mi (10 km). 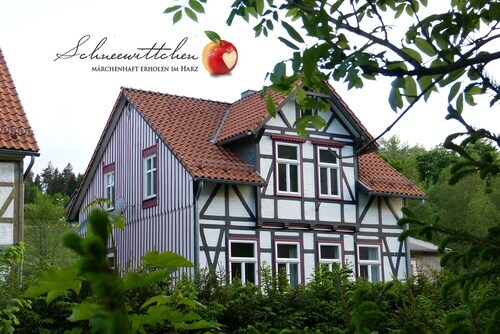 This family-friendly Oberharz am Brocken resort is located on the waterfront, within 2 mi (3 km) of Grenzlandschaft and Museum Sorge and Ring der Erinnerung. Wurmberg Gondola and South Harz Nature Park are also within 6 mi (10 km). 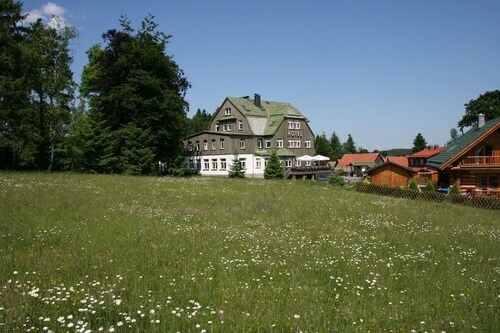 Situated in Oberharz am Brocken, this pension is 0.1 mi (0.2 km) from Grenzlandschaft and Museum Sorge and 1.3 mi (2.2 km) from Ring der Erinnerung. St. Salvator Church and South Harz Nature Park are also within 6 mi (10 km). 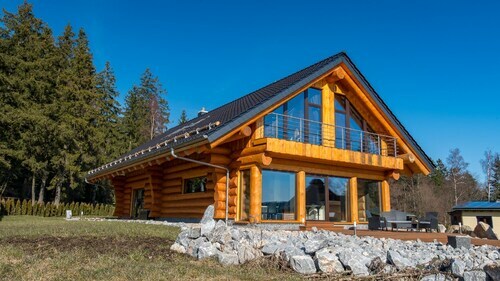 Situated in Oberharz am Brocken, this romantic property is 0.4 mi (0.6 km) from Grenzlandschaft and Museum Sorge and 1.5 mi (2.4 km) from Ring der Erinnerung. St. Salvator Church and South Harz Nature Park are also within 9 mi (15 km). 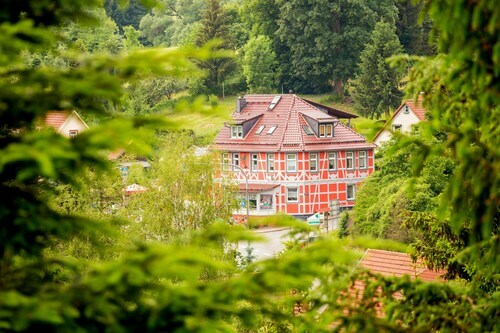 Conveniently located near the ski slopes, this Oberharz am Brocken hotel is 6.9 mi (11.2 km) from Wurmberg Gondola and within 16 mi (25 km) of Rappbodetalsperre and Wernigerode Marketplace. Wernigerode Castle and Brocken are also within 20 mi (32 km). Situated in the mountains, this property is 1.6 mi (2.5 km) from Grenzlandschaft and Museum Sorge and 2.3 mi (3.7 km) from Ring der Erinnerung. St. Salvator Church and South Harz Nature Park are also within 6 mi (10 km). Situated in the mountains, this property is 1.2 mi (2 km) from Grenzlandschaft and Museum Sorge and 2.4 mi (3.9 km) from Ring der Erinnerung. St. Salvator Church and South Harz Nature Park are also within 6 mi (10 km). Situated in Oberharz am Brocken, this apartment building is in the same region as Wurmberg Gondola, Wurmberg, and Pullman City Harz. Regional attractions also include Rappbodetalsperre and Brocken. Situated in Oberharz am Brocken, this property is 1.4 mi (2.2 km) from Grenzlandschaft and Museum Sorge and 2.6 mi (4.1 km) from Ring der Erinnerung. St. Salvator Church and South Harz Nature Park are also within 6 mi (10 km). FW "zur Alten Oberförsterei" - Apartment "zur Alten Oberförsterei"
Situated in a rural location, this property is within 3 mi (5 km) of Grenzlandschaft and Museum Sorge, South Harz Nature Park, and Ring der Erinnerung. St. Salvator Church and Wurmberg Gondola are also within 9 mi (15 km). Enhance your understanding of the region's culture when you visit Grenzlandschaft and Museum Sorge. Oberharz am Brocken, approximately 50 miles (80 kilometers) from Erfurt, the state capital, is where you'll find it. There are 3 nearby accommodation options for you to choose from that are sure to have what you need. 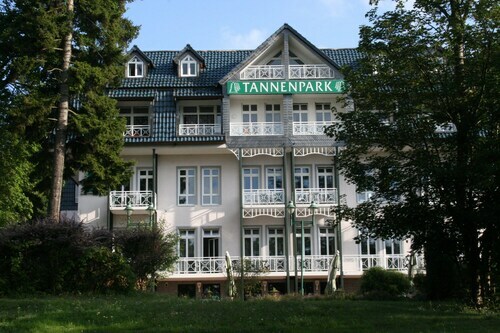 Take your time comparing the different features of the Hotel Tannenpark and Naturstammhaus und Appartements Zum Brockenbäcker, situated within 2 miles (3 kilometers) of Grenzlandschaft and Museum Sorge. Everyone loves a good bargain, and you don't have to travel too far to find one. There are some budget hotels a short drive away. If you aren't quite sure where to start, have a look at the Hotel Askania and the Hostel Braunlage. Live like the rich and famous at one of the handful of high-end hotels that are a short commute away. The Maritim Berghotel Braunlage and Hotel Harzhaus are excellent. Are you the sort of person who loves to have a morning coffee? You can get your fill at Hotel und Berggasthaus "Zum Sonnenhof" (Benneckensteiner Straße 10A, Sorge), which is just 0.2 miles (0.3 kilometers) away. Make your way to Ring der Erinnerung if you've seen all the other museums and you're still looking for more! Think about visiting Kleinste Holzkirche Deutschlands, a pleasant place of worship and a local tourist attraction. St. Salvator Church is a peaceful house of prayer and a local landmark that you might like to see and admire. Are you tired of walking? Treat your weary feet to a much needed rest on Wurmberg Gondola. Feel the winter air against your face as you glide down the slopes of Wurmbergschanze. How Much is a Hotel Room in Grenzlandschaft and Museum Sorge? Hotels in Grenzlandschaft and Museum Sorge start at $71 per night. Prices and availability subject to change. Additional terms may apply.